**As of January 18, 2019, we are capping the shuttle service to Zion National Park. We are grateful for the overwhelming response we've received from our campus community and will post other service opportunities as they become available. 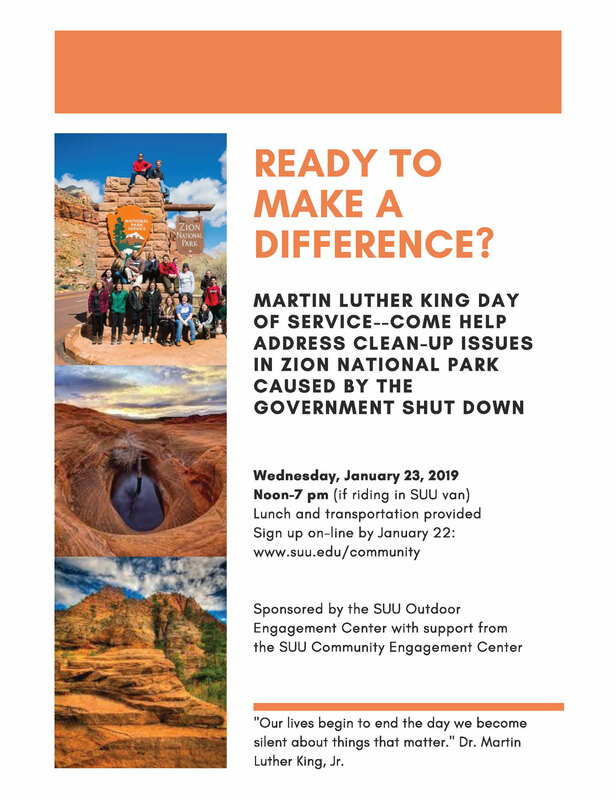 In honor of Martin Luther King Jr. National Day of Service, Southern Utah University has responded to a request to help clean up Zion National Park in light of the federal government shutdown. 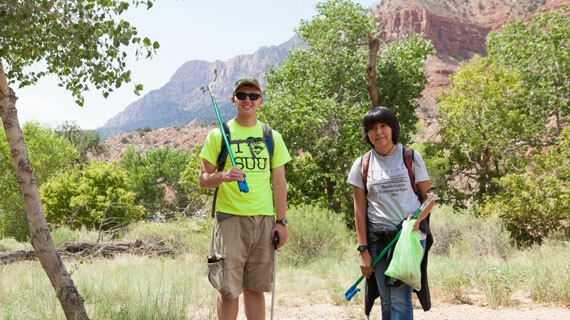 The SUU Outdoor Engagement Center is partnering with the SUU Community Engagement Center on Wednesday, January 23 to help clean up Zion National Park during the federal government shutdown. Faculty, staff, students and community members are invited to participate in the cleanup and can sign up online at the SUU Community Engagement Center website by January 22. Space is limited for those adult volunteers wishing to take the SUU-provided shuttle to the event. The cleanup will take place from 12:00 p.m. to 7:00 p.m. In addition to lunch and transportation, work gloves and garbage bags will be provided by SUU. SUU Outdoor Engagement Center Director Briget Eastep encourages those looking to volunteer to continue to look for ways to make a difference. "Beyond seeking organized events, people who care about parks and trails can make a difference on their own. Become an intentional trail steward and take a hike to pick up trash and clear debris from trails. Look for service projects across the region: the Dixie Mountain Bike Trails Association & Backcountry Horsemen offer regular service opportunities. On campus, the IIC's Public Lands Employment Day will be on Feb 20 from 10-2 in the Ballroom. At this fair, you can find out about paid internship opportunities serving on public lands, in addition, the Community Engagement Center and Outdoor Engagement Center will continue to work with our public land partners to create service opportunities to address ongoing service needs."